Young magpie Marlo is determined to march to the beat of her own drum. No flying for her. Just because she is a bird, it doesn’t mean she has to do what other birds do. She can find her own way to get about. Marlo’s determination to hop, swim or slither is admirable, but will she be willing to fly if it means helping a friend? Marlo’s refusal to fly seems to be part of her determination to be different. She ignores the discouraging comments of the other animals and continues to strike out on her own, but is there a deeper reason for her refusing to fly? I have recently noticed magpies in my backyard and the trees surrounding my house. I love their warbling song, although their swooping attacks aren’t quite as welcome. They have always struck me as a bird with attitude, so it was delightful to read about a magpie with so much personality. Marlo Can Fly is a wonderful story to read aloud with young children. 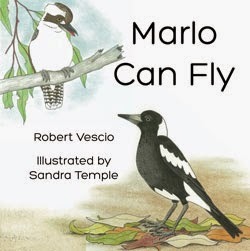 The lovely illustrations by Sandra Temple feature some familiar Australian wildlife and the text by author Robert Vescio includes some great sound words and alliteration to make reading fun. In addition, there are some wonderful prompts for conversations about simply being yourself, trying new things and having the courage to do things that might seem scary or intimidating – like a bird taking to the skies for the first time.